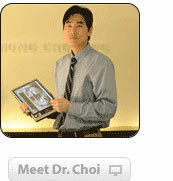 Dr. Inmong Choi earned his DDS (Doctor of Dental Surgery) at Columbia University School of Dental and Oral Surgery. He continued to complete General Practice Residency training at Westchester/Our Lady of Mercy Medical Center. Dr. Choi is a member of Academy of General Dentistry, American Dental Association and New York County Dental Association. With reliable services, trustworthy cares, and lofty professional standards, you can put worries aside in our office.